How far do Bournemouth people go to move to a new house?” This was an intriguing question asked by one of my clients the other week. Readers of my property blog will know I love a challenge, especially when it comes to talking about the Bournemouth Property Market! Using statistics for the 12 months up to the middle of Autumn 2016, 349 households moved out of Bournemouth (BH4), moving an average distance of 33.56 miles – the equivalent of moving from Bournemouth to Fareham (as the crow flies). The greatest distance travelled was 418 miles – that’s more than 16 marathons (when someone moved to Aberfeldy in Scotland). Considering there were 190 property sales in BH4 in the year and countless tenant moves, the numbers seems consistent – once you find a town you like, you tend to want to settle down and if you do move, you might only move to a different neighbour-hood, or for better transport links or, to be closer to the school you want to get your children into, but the likelihood is you won’t travel far. I then turned my attention to people moving into Bournemouth. Using the same statistics for the 12 months up to the middle of Autumn 2016, 263 households moved into Bournemouth (BH4), moving an average distance of 44.13 miles – the equivalent of moving from Trowbridge to Bournemouth (again as the crow flies). The greatest distance travelled was 477 miles – that’s more than 18 marathons (when someone moved from Bunachton in Scotland to Bournemouth). 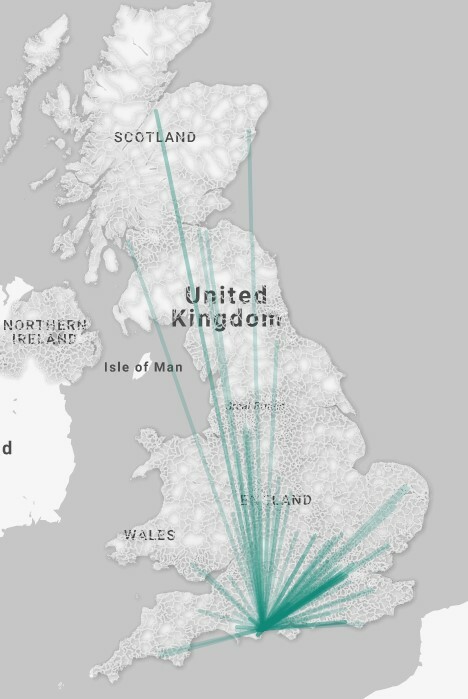 I have looked at the data of every person moving into Bournemouth and these have been plotted on a map of the UK. Looking at the map below, it shows exactly where most people come from, when moving into Bournemouth. As you can see, there are a high proportion of people moving from London and the East. So, what does all this mean for the landlords and homeowners of Bournemouth? The estate and lettings industry loves the mantra “location, location, location”. I say it might be helpful to factor in where (and how) far people are moving from, so the property can be sold or let more easily. Many say knowledge is power and whilst I do enjoy writing my blog on the Bournemouth property market, I also use the information to help my clients buy, let and sell well. So for example, the information gained for this article, will enable my team and I to be more efficient in where to direct our marketing resources to ensure we maximise our clients’ properties sale-ability or rent-ability. For more information on the Bournemouth property market, visit the Bournemouth Property Market Blog. 2,743 Properties For Sale in Bournemouth … is this a good time to sell? March 28th, 2017|Comments Off on 2,743 Properties For Sale in Bournemouth … is this a good time to sell? Letting Agent Fee Ban: How it will affect the landlord and the tenant? March 27th, 2017|Comments Off on Letting Agent Fee Ban: How it will affect the landlord and the tenant?